Zusammenfassung: Das Impact-Echo (IE) wird häufig und mit gutem Erfolg zur Untersuchung von Betonbauteilen eingesetzt. Trotzdem können IE Daten zu Fehlinterpretationen führen, ausgebildetes Personal ist daher eine Voraussetzung für einen breiteren Einsatz der Methode in der Praxis. In diesem Beitrag werden automatisierte IE Messungen beschrieben, die deutlich zeigen, daß lokale Punktmessungen mit dieser Methode zu falschen Ergebnissen führen können. Notwendig sind Rastermessungen zur Identifikation von wahren Meßergebnissen und Geometrieeffekten. Impact-Echo (IE) is used to investigate concrete elements and structures giving often encouraging results. Nevertheless IE data can easily lead to misinterpretation and the requirement for skilled personnel that can provide interpretation has been perhaps so far a limitation to a wider employ of the method. Example laboratory application are here shown, where data, collected in discrete steps and in automated procedure, 2-D data plots of IE data and pseudo 3-D re-elaborations. In the past decades, a variety of semi-destructive and Non-Destructive Testing (NDT) techniques have been tested to investigate concrete elements and structures, to evaluate their integrity and locate defects . Non invasive techniques such as NDT techniques are clearly to be preferred in that they maintain the integrity of the structure. Furthermore, in general, these methods offer the advantage of rapidity at the data collection phase, with minimum activity/traffic disruption, and with coverage of large areas of the element. Impact-Echo (IE), as one of such techniques, has been used to determine concrete thickness, duct cover, and to locate voids and discontinuities in concrete giving often good and encouraging but not always conclusive results [2-8]. Thanks to the availability of commercial systems with data acquisition and analysis enclosed in a user friendly box, almost everybody is enabled to carry out such tests, but not always the claimed capabilities of the systems could be verified or the results reproduced. Especially in the presence of a complex element geometry (box girder bridge, multiple ducts, crossing reinforcements), the experimental results are not always unequivocal and can easily lead to misinterpretation [10, 11]. The requirement for skilled personnel that can provide a reliable and thorough interpretation of the IE data has been perhaps so far a limitation to a wider employ of the method. IE is almost exclusively used as a point method: the operator, based upon his knowledge of the method and structure, or at random, selects a number of points for testing. With this method of local, punctual readings, important information can be missed when the points are badly selected or not enough. Ways to overcome these problems were dealt with in the work reported herein, as described in the paragraphs below. Impact-Echo (IE) testing, currently used in engineering, has only recently become more widely employed in civil engineering, also thanks to the availability of higher-speed computers and data acquisition systems which, at the data analysis stage, permit to perform advanced signal processing and frequency analysis . Applicability of IE testing can be found for example in testing concrete structures and infrastructures [8, 9]. Fig Principle of Impact-Echo testing. The investigations were planned with the aim to get reliable data independently from the operator and paying attentions to aspects such as the reproducibility of IE experiments, structure surface characteristics, position of the reading stations, transducers applied coupling pressure and other effects. After initial experiments with an in-house made IE system, a commercial system (Olson Engineering IE2) was used. The hand held unit was mounted on a frame with which the position and applied pressure to the unit could be reproduced exactly. An in-house developed data collection and data analysis program was used for data collection and the data analysis. It was noticed during initial experiments that even for specimens with simple geometries such as concrete slabs with a step of a few centimeters (1 m x 1 m x 20/16 cm) but otherwise even, it was difficult to collect reliable, reproducible data. Furthermore, to detect large ducts in concrete specimen built like bridge girders was an experimental challenge. In order to exclude operator dependency from experimental factors, the automation of the measurement process was a necessity and a frame system was put in place. The two axis of the frame can move the IE unit in an area of 1.5 m x 2 m with a precision of less than 1/10 mm. Measurements can be automatically taken along lines in any direction and at points spaced by a freely selectable distance. The IE unit is mounted on a handle and pressed firmly with constant force against the testing surface by an air pressure cylinder (fig. 2). At each point, the average of a selectable number of single readings is recorded. With this experimental technique, operator effects can be excluded and the reproducibility of measurements can be achieved. 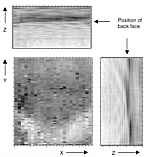 The data sets collected along each line are processed and then data can be plotted in a B-scan like fashion as it is known from ultrasonic test. This enables the user to easily identify features of interest in the data and to distinguish them from noise, geometrical effects or false readings. The specimens used were all made of concrete and have simple geometry as described in table 1. No special surface preparation was used before the experiments took place. The specimens are shown in figures 3 and 4. 1 100 x 100 x 16/20 Plate with a step and a steel tube (diameter 4 cm) parallel to the step. Concrete with max. aggregate size of 8 mm, no additional reinforcement. 2 200 x 150 x 50 Concrete specimen with reinforcement in one half side (along long axis) and a duct (diameter 10 cm). Maximum aggregate size 8 mm. 3 200 x 150 x 50 Same as specimen 2 but max. aggregate size 32 mm. 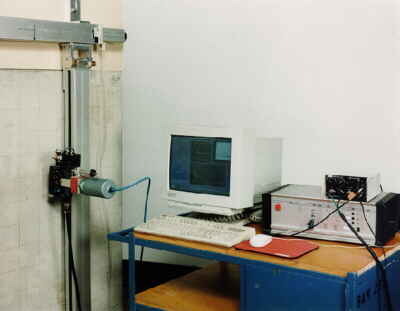 During data collection, a computer program controlled the stepping motors of the frame system and the valve for the air pressure cylinder which pressed the IE unit against the surface. Digital data were collected using a A/D converter (frequency range 10 Hz to 18 kHz) and displayed in real time on the screen both as time series and frequency spectra. 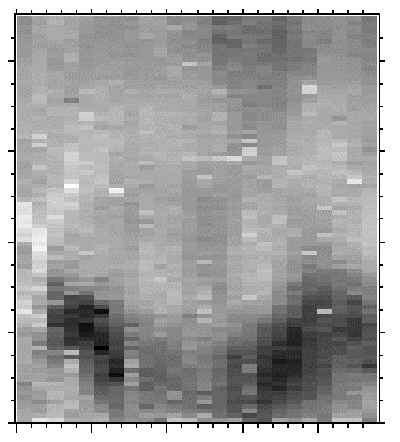 The B-scans are also built up during data collection and visible on the laptop screen. The collected waveforms are stored in run mode and can be processed later for further data interpretation. In the time range, a band pass filter is applied and in frequency domain a high pass filter is applied. The thickness corresponding to a given frequency is calculated through the equation given above. The velocity of sound is determined by calibration on the same object. All experiments were carried out in scan mode i.e. measurements were taken along lines in equidistant points (typically 1-3 cm distance), at each point the average of 3 to 5 single readings was recorded. Specimen 1: A large set of data was collected on this specimen, where the aim was the location of the step and the duct. The thin concrete cover over the duct did not allow a direct measurement of the pipe therefore other effects caused by this element were searched. Figure 4 visualises a scan across the specimen (M004 in figure 3) with the result plotted in measurement position vs. thickness. The back face signal of the plate is clearly identified at 22 cm, the thinner part of the plate at 17 cm. 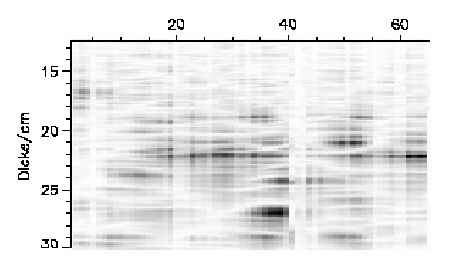 These values are slightly greater than the true value, because of the velocity value which had been determined from ultrasound experiments which gave a slightly larger value. The brighter vertical lines are caused by poor data sets, caused by coupling problems due to surface anomalies where the hammer hit the surface. Besides the clear back side reflection, additional "spots" appear, indicating greater or smaller thicknesses. The magnitude of these signal can be the same as for the back side signal. These additional signals cannot correspond to internal structure in the specimen, they must be caused by the element geometry. From random point measurements, it is almost impossible to reliably distinguish between the true signals and other of the plate effects. At the position of the pipe, which screens the direct measurement of the backside, a much increased intensity is measured at a much greater apparent thickness. It is almost as if the sound waves are focussed by the pipe. The position of the pipe can not be read directly but as increased thickness. All these results underline the necessity to do IE measurements in scan mode to avoid incorrect interpretations caused by badly chosen points for the measurement. These findings have been verified by tests on other specimen in a variety of shapes, concrete mix and amounts of reinforcements. Specimen 2 has a duct built in which has a concrete cover of 15 cm from one side. Previous IE tests did not locate the duct . A large set of data was collected on this specimen: 27 parallel lines with 90 points each separated 1 cm. At each point, the average of three single measurements was collected. This 3D-array was used to create images of projection slices through the specimen. Fig 7: Result of scanning IE testing on specimen 2: Projection of the 3D data subset from thickness 56 to 58 cm. The duct is visible as an area of higher intensity! Figure 6a shows the XZ projection, figure 6b the YZ projection and 6c the projection in the XY plane. The XZ and YZ projections clearly demonstrate that there is no sign of a direct measurement of the duct. These figures also reveal that the backside echo is not a single straight line at the thickness of the specimen, but is a collection of several slightly shifted reflection horizons. Creating a projection through the data set using only data beyond the element thickness results in figure 7 which shows clearly the position of the duct in the XY-plane. What happens is that the back side signal is screened by the presence of the duct, the path for the waves is longer around the duct and the backside signals appear "behind" the specimen. Again, it looks like the duct is somehow focusing the sound waves onto the backside. These findings were confirmed by measurements at another specimen of the same kind (specimen 3) and the results also confirm the measurements on specimen 1 where the steel pipe had the same effect at a much thinner specimen. The results clearly show the advantages of scanning over point measurements. They unambiguously prove that IE can lead to wrong results when point measurements are used for interpretation. Geometrical effects seem to play a very important role in data interpretation and it is intended to study them further. Simulation of IE experiments would be a very helpful tool for fully understanding the experimental results. The authors acknowledge the technical assistance of Mr. D. Schaurich and Mr. P. Croy during the preparation phases to laboratory testing. G.A. Washer, "Developments for the Nondestructive evaluation of highways bridges in the United States", Proc. Non-Destructive Testing in Civil Engineering, (NDT-CE '97) Liverpool, UK, vol. 2, pp. 543-552, 1997. M. Krause, M. Bärmann, R. Frielinghaus, et al., "Comparison of pulse-echo methods for testing concrete", NDT&E International, Vol. 30, 4, 195-204, 1997. Ghorbanpoor, "Evaluation of post-tensioned concrete bridge structures by the impact echo technique", Publication No. FHWA-RD-92-096, Federal Highway Administration, U.S.A., 1993. J. Martin, M. Hardy, A. Usmany, M.C. Forde, "Impact-echo assessment of post tensioned concrete bridge beams", Proc. 7th Int. Conf. Structural Faults and Repair, Edinburgh, UK, vol. 1,. 341-354, July 1997. N.J. Carino, M. Sansalone, N.N. Hsu, "Flaw detection in concrete by frequency spectrum analysis of Impact-Echo waveforms", International advances in Nondestructive testing, 12, 117-146, 1986. M. Sansalone, N. J. Carino, "Detecting delaminations in concrete slabs with and without overlays using the impact-echo method", ACI Materials Journal, March-April, pp. 175-184, 1989. M. Sansalone, W. Streett, "Use of the impact-echo method and field instrument for non-destructive testing of concrete structures", Proc. Int. Symp. Non-destructive Testing in Civil Engineering (NDT-CE), Berlin 1995, pp. 495-502. M.Sansalone, N. Carino, "Impact-echo: a method for flaw detection in concrete using transient stress waves", National Bureau of Standards Report NBSIR 86- 3452, Gaithersburgh, Maryland, September 1986. D. Sack, L. Olson, "Impact-echo scanning of concrete slabs and pipes", CANMET/ACI Int. Conf. Advances in Concrete Technology, Las Vegas, June, 1995. Krieger, J., Krause, M. und Wiggenhauser, H., Erprobung und Bewertung von zerstörungsfreien Prüfmethoden für Betonbrücken, BASt, Bergisch Gladbach 1998. Krieger, J., Krause, M. und Wiggenhauser, H., Tests and Assessment of NDT methodsfor concrete bridges, in: Medlock, R. D. and Laffrey, D. C. (Eds. ); Structural Materials Technology III, Proceedings of SPIE, Vol 3400 (1988) pp. 258-269. D. Sack, L. Olson, "Impact-echo scanning of concrete and wood, Nondestructive Evaluation of Ageing Infrastructure", SPIE, Oakland, CA, June 1995. D. Sack, L. Olson, "In-situ Nondestructive testing of buried precast concrete pipes", ASCE Materials Engineering Conferences, San Diego, CA, Nov. 1994.